Spear’s flagship event, the Wealth Management Awards acknowledge and honour entrepreneurs, philanthropists and others for their innovation, success and outstanding contribution. Over 500 of Europe’s most successful, influential and wealthy individuals gather to celebrate and meet the best and most innovative individuals and companies across the high-net-worth world. The shortlists are drawn from those featured in our annual peer-reviewed series of Spear’s Indices or are put together by expert recommendation. Our categories include Private Banker of the Year, Entrepreneur of the Year and Philanthropist of the Year. The shortlists are then critiqued by a panel of experienced judges to arrive at a winner in each category. 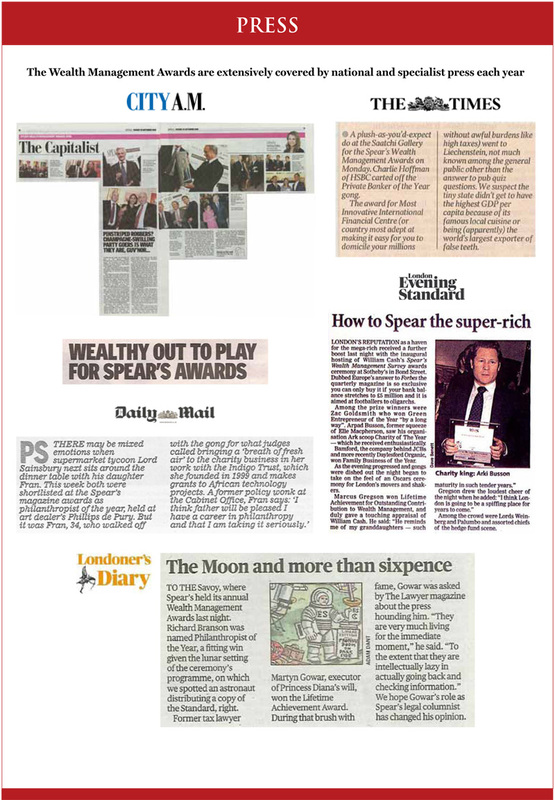 The event is extensively covered in Spear’s magazine and digitally via Twitter and online at spearsmagazine.com., as well as in the daily newspapers and trade press. Rupert Adams and Nadja Swarovski, Godfrey Barker, Nathalie Dauriac-Stoebe, Sandra Davis, Mike Danson, Zoe and Olivier de Givenchy, Martha Fiennes, Britt Lintner, Sophie and David Montgomery, Keith Schilling, Cosima Somerset, Sam Waley-Cohen, Dame Stephanie Shirley, the Earl and Countess of Carnarvon, Lord Chadlington, Lady Emily Compton, Lady Palumbo, Joe LaPlaca, Dora Loewenstein and Manfredi della Gherardesca, Alan and Gina Miller, Harry Mount, Edward van Cutsem, Toby Young, Sir John Madejski, Sir Mark Weinberg, Peter York, Viscount Linley, Balthazar and Beanie Fabricius, Fiona Shackleton, Rona Fairhead, Alexander Hoare, Michel de Carvalho, Ali Spencer-Churchill, Adam Dant, Anton Bilton, Charlie Methven and Ivan Massow, as well as the CEOs of London’s top private banks and law firms and some of Britain’s wealthiest individuals. Spear’s is the multi-award-winning wealth management and luxury lifestyle media brand whose flagship magazine has become a must-read for the ultra-high-net-worth (UHNW) community. Described as the ‘Bible of the banking fraternity’, with its own wit and outlook, it is also required reading for the affluent financial services community, including the bankers, lawyers and family offices who advise the wealthy. Through the Spear’s Wealth Management Awards, Spear’s is uniquely placed to connect financial and luxury brands to this exclusive and elusive audience. A cocktail party and award ceremony, this annually attracts London’s wealthiest and most influential people, who mingle and network and are introduced to sponsors.